We spend most of the waking hours of our adult life at work. 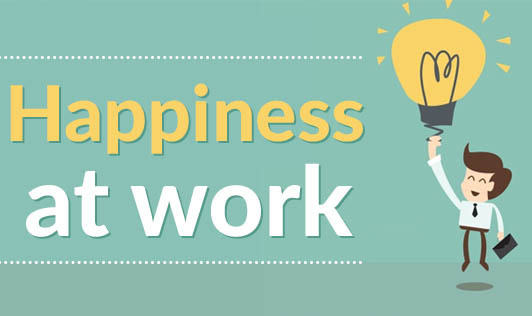 So doesn’t it make sense that in order to be happy in the long run, we should be able to find happiness everywhere; even at the office? Sadly, only a handful of us are blessed with the opportunity to follow our passion. The rest of us have to settle for whatever we manage to find as per our skill sets. But that does not mean, you need to sulk all the time. Maintaining a positive attitude at the workplace, especially in a stressful environment can be quite a task. Be well informed about your responsibilities and make sure you are completing tasks on time. List the tasks that do not fall under your set of responsibilities. List the tasks you enjoy the most and manage to excel in. It could be making presentations, visiting clients, or being an efficient team leader. List the tasks you do not enjoy so much and the reasons for you not enjoying them. Also write down what you can do to improve your chances of success in accomplishing these tasks. Now carry your lists to your manager and talk it through with him/her. Talk in detail about the various points you have jotted down, so that your manager will know that you are serious about making a positive contribution to the organization. Keep your desk clean at all times and set up your personal workplace. This will make you feel like you have more control over your work. Prioritize your tasks and try to finish them in the order you plan. Try to meet deadlines as much possible. Take planned breaks and don’t stay at your desk during break time. Go out for a walk. Also, never eat lunch at your desk. Move around and interact with people as much as possible. Try, as much as possible, to finish work in the office and never take work home. Try to tune out the moment you step out of office. Working late should also be a rare occurrence. Take time out to talk to your co-workers. Do not gossip. Instead share information and knowledge with them. Plan your weekends in advance and try to make the most of it so you can get back to work on Monday more energized and happy. Try and implement as many of these tips as possible & stay happy.